Some scheduler apps limit you to one or two social platforms or limit scheduling features on certain social platforms. 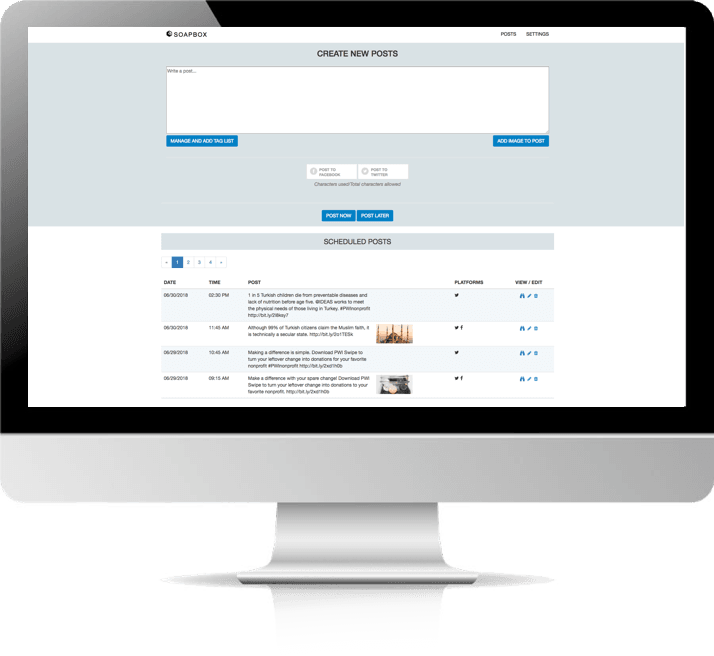 With Soapbox, we allow you to easily schedule, manage, and publish content on all of the big four social media networks: Facebook, Twitter, Instagram, and Pinterest. Features include viewing your upcoming and past posts, photo uploads, and scheduling the same post on multiple platforms at once. Use the same set of hashtags frequently? Create and saved lists that include your most used hashtags and easily insert them into the post. Stay trending and keep your followers engaged throughout the day and night. You set the schedule, we manage the publishing. You’ll never have to manually publish and manage posts or limit them to “business hours”, ever again. Your social media networks are just new channels for your brand’s voice and content. Published by Convince & Convert 53% of Americans who follow brands in social are more loyal to those brands. 3. More Opportunity to Convert. Every post you make is an opportunity to share your story and convert bystanders to loyal supporters. Studies have shown that social media has a 100% higher lead-to-close rate than outbound marketing. See what is trending and connect with what people are interested in.